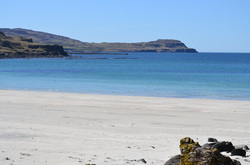 Hire a Camper Van or Motorhome to explore the beautiful Isle of Mull and the other Hebridean islands on Scotland's West Coast in comfort. We are based on the Isle of Mull, a 45 minute ferry ride from Oban. We meet you from the ferry, show you the ropes, hand over the keys and your adventure can begin. We currently only have one van available to hire which is the awesome Bongo! ​Hire a Mazda Bongo Campervan - perfect for Mull roads and so easy to drive. Best suited to a couple, but there is space for a small person in the roof bed. Fully equipped with gas hob, sink, fridge, lights, CD/Ipod player and electric heater for when you have electric hook up. Easy to put up 4 man tent included by request. Chemiloo available by request. We advise early booking to avoid disappointment. ​***SPECIAL OFFER*** - Hire the Bongo for a week and only pay for 4 nights! Book online but don't make a payment and we'll adjust the booking to add the discount when we receive it. All our vans come with amazing views as standard! You'll be able to travel around the whole island, exploring the 300 miles of glorious coastline, castles, mountains and wild places. Meals on wheels and make a cuppa whenever you fancy. You're free to do what you want, any old time! You are welcome to take the vans off island to explore further afield and all the wonderful islands and areas the West Coast is famous for. Around every corner in Mull there is something special. CLICK HERE to find out more about where to go. -Vans available for collection from Craignure, Isle of Mull. ​-Arrival and departure days must be a Monday or a Friday. Take the ferry from Oban to Craignure. - Vans can be taken off island by prior arrangement. - Requirements: You need to be between 21 and 79 years of age, have had a driving licence for at least 2 years and have no convictions. See terms here. You need to pay a refundable deposit of £500, bring photo ID, your drivers licence, a print out of your Drivers Record (UK licence holders only) which can be found on the DVLA website, and address ID eg. a utility bill. For international guests please bring your passport aswell. We reserve the right to cancel any booking at short notice should a van become damaged and unsuitable for hire.